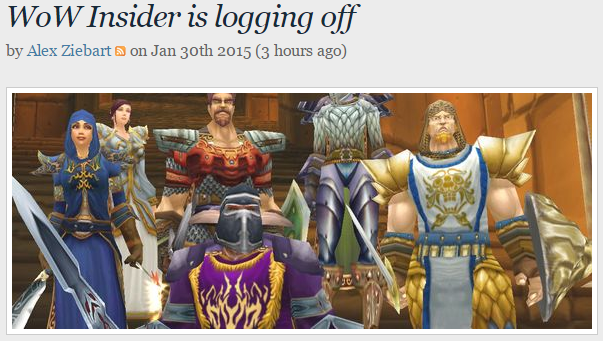 WoW Insider might be finished, but not all of its staff members are. 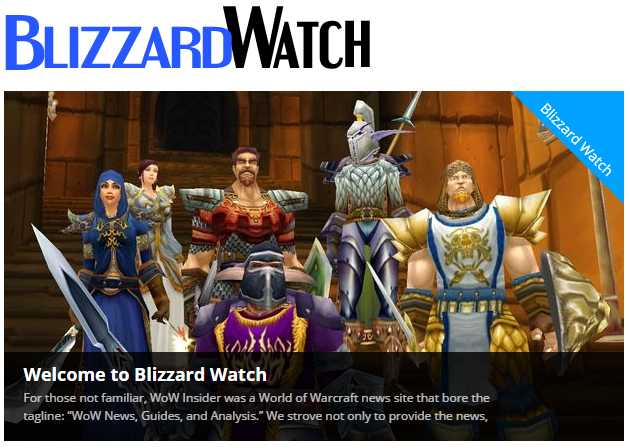 From its ashes, Blizzard Watch rises. As the name implies, it’ll cover all Blizzard titles, although it’ll focus primarily on World of Warcraft. It seems that Alex Ziebart, Editor-in-Chief of WoW Insider at the time of its closure, is in charge, but that wasn’t explicitly stated. Adam Holisky, Anne Stickney, Matthew Rossi, and Elizabeth Harper are joining him, and they hope to reach out to more people later. Blizzard Watch is using Patreon to support the site. It’s a crowd-funding site that works a little differently than sites like Kickstarter. With Patreon, you pledge a certain amount per month. Their milestone goals were $8,000/month for full operations, $9,000/month for class columns, $10,000/month for expanded class columns, and $12,000/month for expanded coverage. They quickly reached their first goal and are currently, just a day after opening, hovering near $11,000/month. That’s pretty cool! One of the first posts (if not the first) was one calling for Queue questions. No post could have made me happier. I love the Queue, and I’m very glad to learn that it’s going to continue to be part of my morning ritual. Thank you, Blizzard Watch and team, for continuing your great reporting and writing! Why Have Gear?, Balkoth, Balkoth’s Word, 10/18/13. In this piece, Balkoth, one of my favorite WoW bloggers, discusses the importance of the role of gear in WoW. He also heavily quotes and responds to Rowan of I Have Touched the Sky. It’s a great read. Potential new WoW feature caught on video, Olivia Grace, WoW Insider, 10/23/13. Is this a bug, or is this the dungeon scaling technology? Know Your Lore, Tinfoil Hat Edition: Twists in time, Anne Stickney, WoW Insider, 10/20/13. What’s up with time right now? err, back then? in the future? The Daily Grind: Is crowd control in MMOs dead?, Brianna Royce, Massively, 10/18/13. I hadn’t even realized it was so important before WoW. A Counter-Intuitive Idea For Tanks in LFR, Rohan, Blessing of Kings, 10/16/13. Rohan notes that there’s room for bad healers or DPS in LFR but not tanks. He speculates that increasing the number of tanks (while keeping encounters tuned for two) would make tanking more forgiving and possibly yield more people queuing as tanks. It’s a great idea. An Alternate Explanation for Gender Bias in Healing and Tanking, Rohan, Blessing of Kings, 10/8/13. Here’s another fantastic piece by Rohan. He provides an alternate explanation on gender bias in which he speculates that women prefer to stay at range while men prefer melee. It’s interesting. Crowd Control & Diminishing Returns, Lore, World of Warcraft Forums, 10/11/13. If you’ve wondered what CC shared diminishing returns, this great thread has you covered. Know Your Lore: A brief summary of the Pandaria campaign, Matthew Rossi, WoW Insider, 10/9/13. This is a fantastic summary of what’s happened in Pandaria. Reputation in review: Pandaria, Anne Stickney, WoW Insider, 10/14/13. A consideration of the different reputation experiments in Mists of Pandaria. Know Your Lore: The fate of Garrosh Hellscream, Anne Stickney, WoW Insider, 10/13/13. Nothing new, but interesting look at why things happened the way they did. Spec and Talent design likely to remain unchanged in 6.0, Olivia Grace, WoW Insider, 10/15/13. If you read the article title, you don’t really need to read the article. WoW Archivist: Spells we’ve lost, Scott Andrews, WoW Insider, 10/11/13. An examination of spells that have been removed. I’m ready to lose more.